For the design and construction industry, using Building Information Modeling (BIM) for effective and efficient project delivery is not a new idea. At the same time, the integration of BIM into the day-to-day activities of a building owner is more of a new concept. This is especially true with colleges and universities who are beginning to make BIM a priority on their campus and are embarking on the creation of their own BIM standards to reap the benefits of this industry—transforming technology and process to reduce the total cost of ownership across the lifecycle of the buildings they own and operate. enhance planning and communication resulting in improved quality and speed of decision-making. 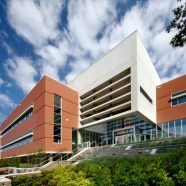 Capitalizing on the BIM best practices that are developing across the design and construction world, the university quickly realized the value BIM could bring to their project delivery and operations processes. They are also realizing the benefits of partnering with a firm like CannonDesign as a trusted thought-leader in BIM and project delivery. I will be speaking on a panel on September 23rd at OSU to present the development and use of these standards along with the return on investments that we have experienced along the way with our client. So, should your college or university adopt a BIM standard? You will realize more cost savings. Bottom line, the cost savings is worth the implementation of BIM. 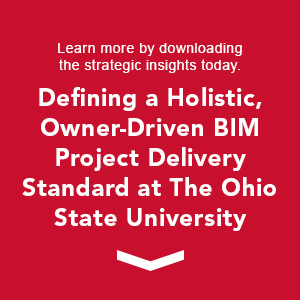 BIM-enabled university projects can drive a more efficient and collaborative project delivery process providing positive impacts to project schedules and budgets. Moreover, BIM can be utilized to drive more sustainable project outcomes increasing energy efficiency goals being set by institutional owners that can which generate additional savings. Design can be a useful tool in meeting the overall goals of the university. Everyone will be speaking the same language. By adopting a BIM standard, owners are able to create a BIM-enabled process where the BIM, its use case, and its deliverables can all be developed around a common language. This common language and repeatable process drives value by setting expectations from the outset of the project, ensuring all project team members are collaboratively working towards a common goal. Building operators and managers will be more empowered. Following the project completion and turnover phase, progressive owners can quickly realize the value of this well-structured BIM by automating and expediting the consumption of geometry and data into their facilities management and operations systems. Historically, this has been a time consuming and manual data entry process which the NIST has summarized to have a cost for owners of $0.15 per square foot associated with it. Not only is there a direct cost savings generated by this interoperability, but the National Institute and Standards quantifies a reoccurring value of $0.23/sf/year throughout the building’s lifecycle through ongoing avoidance, mitigation and delay costs. If you were to apply this reoccurring cost on a 100,000 sf building across a 30 year lifecycle, an owner could realize a potential cost avoidance of almost $700,000. Of course this is only one build, but for colleges and universities, this cost can exponentially grow across an entire campus.